I can’t honestly remember how I became interested in The East Village Other. Probably, it’s just the age-old thing of a son wanting to know more about his father. That my father’s twin brother was also part of that scene (more involved as it turns out), made it even more curious. The more I researched the whole thing, the more I became aware of what an important part of history they had been. I suppose it’s not every kid who would make a Freedom of Information Act request to learn everything he could about something, but that was the historian in me back in 1989 when I was writing my undergraduate thesis at the University of Colorado at Boulder. There were lots of stories about possible surveillance and possible this and that. I wanted to know for sure. The documents came back from the FBI and many of them were typical FBI documents – not all that interesting and with lots of stuff blacked out. However, there were also many surprises, many little semantic treasures, and many things revealed that one might think shouldn’t be. The following account was culled from the most interesting of those documents. In September 1967, The East Village Other hatched a plan to bomb the Pentagon. The planned date of this bombing was Oct. 20, 1967 (though it was changed to Oct. 21 at some point or the FBI got the date wrong in its original memorandum), the day before the National Mobilization Committee to End the War in Vietnam was to hold its march on Washington. On page 22 of EVO’s September 1-15 issue was a not-so-subtle ad: “Pilot Wanted for Daring Feat, phone 228-8640, ask for ALLEN or WALTER.” Allen was my uncle, Allen Katzman and Walter was Walter Bowart. The plan was true and the FBI took immediate notice, only the bomb wasn’t nuclear or conventional. It was flowers. EVO had been on the FBI’s radar since April 8, 1966 when J. Edgar Hoover received a memorandum from SAC, New York, concerning the ninth issue of the paper. That issue recreated an FBI wanted flier featuring Dr. Timothy Leary, Ralph Ginzburg and Allen Ginsberg. 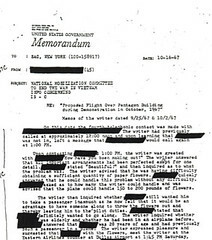 Hoover responded in a memorandum back to New York on April 14, 1966, characterizing EVO as “typical of beatnik literature” containing “numerous obscenities and off-color remarks.” At Hoover’s direction, the New York office contacted my uncle to inform him that EVO was violating Public Law 670 and that he had no authority to reproduce an official document of the FBI. Hoover wrote back sympathetically but acknowledged the inability to do much about it. The FBI also received a panicked message from the Federal Power Commission in 1970 when EVO encouraged New Yorkers to turn on all the appliances in their houses to blow out the northeast power grid. There was little the FBI could do and nothing came of EVO’s idea anyway. When it came to bombing the Pentagon with flowers though, the FBI went into full counterintelligence mode. The New York office informed Hoover of EVO’s plan and began counterintelligence to convince EVO’s organizers they had a compliant pilot until it was too late for them to get somebody actually willing to do the job. Two plans were proposed, one involving only phone calls and the other, a personal meeting. Ultimately, the FBI decided to avoid any personal meetings if at all possible so there was no chance EVO would discover the pilot was an agent and generate unfavorable publicity for the Bureau. …a blue coat with white stars resembling the blue field in the American flag. He also wore a black, wide brimmed uncreased hat, faded blue bell bottom dungarees, and black cowboy boots. He had a heavy mustache and no beard, long heavy side burns and his hair was tied in a small bun in the back. [Walter’s] dress reflected no apparent desecration of the American flag. FBI mission accomplished. Without the FBI’s surveillance and effort, The East Village Other might have succeeded in dropping a planeload of flowers on the Pentagon. Embarrassment was prevented, proving that a bunch of hippies, beatniks, and bohemians couldn’t pull off such a stunt if the government meant to keep it from happening. And certainly, taxpayer money was saved – crews never had to sweep up two hundred pounds of paper flowers that might have covered the Pentagon building and grounds. While EVO celebrated many achievements and acts of subterfuge on its own pages, this battle was clearly won by the FBI. Jason Katzman is the son of EVO’s accountant, the late Donald Katzman, and the nephew of the late Allen Katzman, one of EVO’s founders, who, with his 10-year-old daughter, was tragically killed in a collision in 1985. Jason Katzman is self-publishing his thesis, “The Rise and Decline of The East Village Other: October 1965 – November 1968” as smaller articles here, here, and here. Following in his father’s and his uncle’s footsteps in some odd way, the younger Mr. Katzman co-founded Mr. Cranky Rates the Movies in 1995, one of the more famous and infamous movie review sites on the Internet, known for its harsh, always negative reviews, no matter the movie. Mr. Cranky was named one of the 10 best movie review sites of the decade by MSN UK.